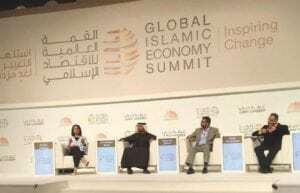 DUBAI – The halal food industry is still far from achieving its full potential and not leading in quality and profitable business, according to industry experts at the Global Islamic Economy Summit held here that covers a wide range of economic sectors impacting 1.6 billion Muslims globally. Muslims currently spend around $1.1 trillion on food annually. This makes about 17% of total food consumption. An estimated 450 billion worth of that food is certified. However, Muslim countries rely much on importing food products. The Organization of Islamic Cooperation countries import as much as 50% of their vegetable products, 32% of processed food, and 18.5% of animal products. There are bigger opportunities than standardizing halal certification around the world, according to Rafiquddin Shikor, Managing Director of Dinar Standard in the UAE. He said Muslims should focus on value creation. The definition of halal varies quite a lot depending on countries, according to Zohra Khaku, founder of digital magazine Halal Gems specialized in halal food. “Those in the UK are trained to look at ingredients on the labels because it’s an individual’s responsibility. In the GCC, however, people have a more flexible approach when eating abroad,” she told Saudi Gazette. Asked about the awareness level of Muslims about the definition of halal, she said: “We could do with more education. We also need more food bloggers. Halal Gems launched an app to find halal restaurants worldwide. “We aim to educate people around halal food and to give them insight to halal restaurants around the world,” she said. Defining one set of standards for halal food is necessary in the meantime, but will be challenging in the coming years. There are over a hundred certifications around the world that vary in strictness and standards, pushing consumers away from trusting products. The organization now is currently making an agreement between countries to create one unified approach that is expected in a few years to have one logo with an agreed standard.